Oscar Mercado found himself at a crossroad in 2016. A second-round Draft pick of the Cardinals three years prior, he was barely hitting .200 and struggling on defense at shortstop with Class A Advanced Palm Beach. Two years later, Mercado is knocking on the door of the Major Leagues with Triple-A Memphis. The 23-year-old Florida native is batting .302/.368/.440 with six home runs, 31 RBIs and 18 stolen bases while shining in center field for the Redbirds. Mercado's resurgence all came thanks to a few days off and some major adjustments. "I worked a lot with our hitting coordinator [George Greer] in 2016," Mercado said. "I was taken off the roster, maybe like five days. I spent a lot of time with our hitting coordinator in the back fields while our team was on the road. "We just worked and worked and worked, and just kind of tried to figure out flaws to make my swing better, to shorten it up a little bit, to get more consistency out of it. I kind of just stuck with everything he told me. I knew what I needed to do -- I just had a hard time trying to incorporate it into a game." After Mercado was able to incorporate the mental adjustments with the mechanical adjustments, he turned things around. His .215/.296/.271 slash line for that year would have looked even weaker had he not batted .280/.374/.350 with seven doubles and seven steals in August. "I was fortunate enough to fix some things and those changes worked out for me a little bit," Mercado said. "I finished that season off strongly even though the numbers at the end weren't anything special. The last month and some change I was able to put together good at-bats, put together good streaks. I was able to go into the offseason with some confidence." The Cardinals also decided to switch Mercado's position after 2016, moving him from the dirt to the grass. "I love it out there. I think it's fun," he said. "I can just be free. I can let my game play out there, put my speed to work." Mercado doesn't believe he allowed his defensive woes to affect his hitting, but in retrospect even those struggles have made him stronger since. "I don't have to have the constant pressure of shortstop, which I think I owe a lot to my struggles there," he said. "I was able to deal with failure, which is not something a lot of other players have to deal with. I was fortunate to get that out at an early age in my career to where later on I'm mentally way stronger. Physically I'm stronger. It's kind of like a blessing in disguise." His natural maturation since being drafted in 2013 also helped his development on the field. "The pressure is there to perform. People want to see results quickly," he said. "People fail to realize at the end of the day, you're a high school kid. Your body and mind aren't developed yet. There's still so much to learn." 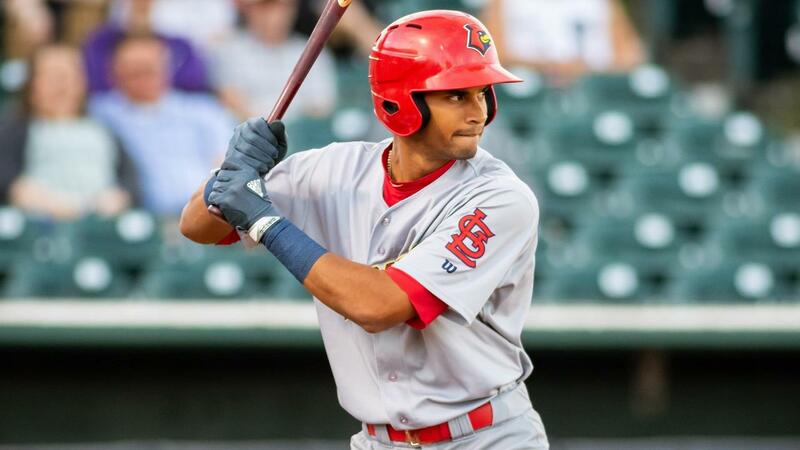 Now the eighth-ranked prospect in the St. Louis system, Mercado is confident that if he continues to perform at a high level, he will get a chance in the Majors. "The organization does a great job of developing its players," Mercado said. "[The Cardinals] take a lot of pride in winning with homegrown players. As a guy who's been here his whole career, you're pretty excited about that." Alonso aloft: No. 2 Mets prospect Peter Alonso has easily adjusted to life in the PCL since being promoted to Las Vegas earlier this month. After batting .314/.440/.573 at Double-A, the big first baseman has hit .300/.417/.633 in eight games with the 51s. Miller's time: Ian Miller, the Mariners' No. 15 prospect, has shaken off a slow start to the month of June. The center fielder hit .300 (12-for-40) over his last 10 games and is at .288/.371/.345 for the season, while also racking up 19 stolen bases. Role change: The Brewers have moved struggling No. 2 prospect Corbin Burnes to the bullpen at Colorado Springs. The right-hander had a 4.96 ERA through 13 starts and has allowed two runs in four innings of relief, striking out six batters. Chris Jackson is a contributor to MiLB.com This story was not subject to the approval of the National Association of Professional Baseball Leagues or its clubs.